San Diego, September 2, 2009 -- The U.S. has taken the next step toward construction of the revolutionary Ocean Observatories Initiative (OOI): a network of ocean observing components, and their associated cyberinfrastructure, that will allow scientists to examine ocean processes on global, regional and coastal scales. The National Science Foundation (NSF) and the Washington, D.C.-based Consortium for Ocean Leadership (Ocean Leadership) have signed a Cooperative Agreement today that supports the construction and initial operation of the OOI. In collaboration with Ocean Leadership, the University of California, San Diego (UCSD) is slated to receive a total of approximately $32 million to develop and construct the science-driven, networked cyberinfrastructure, which ties together all the ocean sensors to be deployed during the next five years. 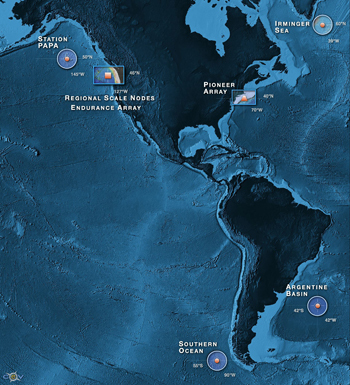 "The OOI provides scientists, for the first time, an infrastructure to conduct interactive experiments in some of the ocean's most extreme environments," said Principal Investigator John Orcutt, a professor of geophysics at UC San Diego's Scripps Institution of Oceanography, "This interactive capability will be enabled by the OOI cyberinfrastructure, which links and binds the physical infrastructure into a state-of-the-art scientific network that can be accessed in near-real-time (within seconds of data collection) by any scientist; in fact, any person." The near-real-time access and complete openness of the data are unique to the OOI. "OOI has been under design by NSF and its contractors for nearly a decade," said Scripps Institution of Oceanography Director Tony Haymet, "and significant institutional support from Scripps and its partners has contributed to the successful development of the OOI over that period. We are delighted to be playing such a key role in implementing these critical capabilities for ocean science and society." 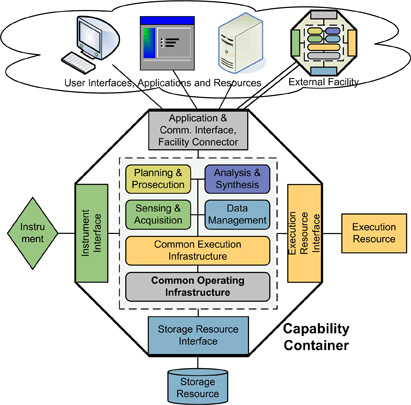 The OOI cyberinfrastructure deployment strategy is based on the concept of a capability container that provides all essential infrastructure elements and selected deployment-specific application support. Considerable international interest exists about ocean observing, with cabled observatories in place in Canada, Japan, Europe, and Australia, and under construction in China and Korea. The OOI expands those international capabilities, using cabled, moored, and mobile observing tools to broaden the scope of ocean conditions under rigorous observation. The UCSD division of Calit2 manages the day-to-day functions of the project and will design and build the cyberinfrastructure. The 5.5-year construction phase will begin in September, with nearly $106 million of first-year funds coming from the American Recovery and Reinvestment Act of 2009, and $5.91 million in NSF construction funds. Requests in FY 2010 and beyond, totaling $274.58 million for construction, will enable the acquisition of OOI instruments and sensors, production of key infrastructure elements (such as the coastal and open ocean moorings), and the deployment of these assets. Once construction is completed, scientists will be able to observe complex ocean processes such as climate variability, ocean circulation, and ocean acidification across a range of spatial scales at several coastal, open-ocean, and seafloor locations. Continuous data-flow from hundreds of sensors will be integrated by the sophisticated computing network developed by Scripps and Calit2, and will be available to scientists, policy makers, students, and the public. The OOI will transform ocean science research and education by providing unprecedented power and bandwidth for an interactive connection to the ocean through diverse sets of sensors, and near real-time access to data. 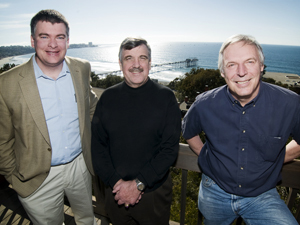 The OOI Cyberinfrastructure project team is led by Principal Investigator John Orcutt (center), OOI Deputy Director Frank Vernon (right) and Calit2 Chief System Architect Ingolf Krueger. The first year of funding under the Cooperative Agreement will support a wide range of construction efforts, including production engineering and prototyping of key coastal and open-ocean components (moorings, buoys, sensors), awarding the primary seafloor cable installation contract, completing a shore station for power and data, and developing software for sensor interfaces to the network. In 2010, the program will add an Education and Public Engagement team that will use the OOI data streams and infrastructure to develop innovative approaches for outreach. During a lesson on the El Niño phenomenon, for example, a science teacher might use a combination of the OOI's raw scientific data, data graphs and annotated Google Maps to write an application that visualizes ocean temperature distribution near the California coast. A lesson on deep-sea microbial ecologies might involve watching a high-definition video feed that captures an underwater volcano emitting plumes of superheated water. Key to innovation in education and outreach will be harnessing the power of the OOI cyberinfrastructure for educational purposes. The UCSD cyberinfrastructure team, including dedicated educational technology specialists, will help establish the critical links between the OOI and non-scientist audiences. Subsequent years of funding will support the completion of coastal, deep-ocean, and seafloor systems, with initial data-flow scheduled for early 2013 and final commissioning of the full system by 2015. 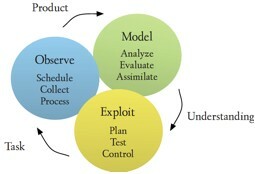 OOI Cyberinfrastructure will be based on this scientific process model for ocean observatory activities. "This award represents the fulfillment of over a decade of planning and hard work by hundreds of ocean scientists, and also reflects the commitment of the National Science Foundation to new approaches for documenting ocean processes," said OOI Program Director Tim Cowles. "Those of us within the OOI project team are excited to play a role in implementing this unique suite of observing assets - knowing that we're building an infrastructure that will transform ocean sciences." The OOI is managed and coordinated by the OOI Project Office at the Consortium for Ocean Leadership, with three major implementing organizations responsible for the construction of the components of the full network. In addition to UCSD and its partner, Woods Hole Oceanographic Institution, being responsible for the Cyberinfrastructure, Woods Hole Oceanographic Institution and its partners, Oregon State University and Scripps Institution of Oceanography, are responsible for the Coastal and Global moorings and their autonomous vehicles. The University of Washington is responsible for cabled seafloor systems and moorings over the Juan de Fuca tectonic plate.